It had been ages since a novel kept me up all night, glued to the pages, marveling at a witty turn of phrase. Reading The Escape of Malcolm Poe s akin to devouring a spicy gourmet feast of a meal, enticingly good but surprisingly acerbic Allison Burnett paints a colorful yet dark picture of what it means to turn 50. Satirical to his core, Burnett is the God of smartasses and, paradoxically, the king of tender and lyrical prose. He brandishes a sword in one hand at each introduction to a new character while carrying roses in the other. At first you find the protagonist to be an arrogant, self-absorbed little twit, but by the end you discover a tender heart beating wildly under a guise of burlesque. Malcolm Poe is as endearing as he is infuriating. This novel is a visceral lesson in the drudgery, angst and the harrowing emotional transition that often comes with mid-life, a comedy and a tragedy, a book in which Burnett crafted a portrait so real that I sometime forgot I was reading a work of fiction. 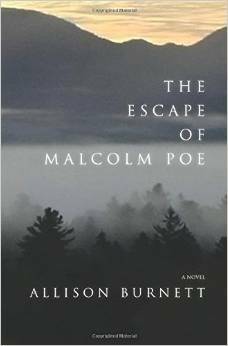 The Escape of Malcolm Poe is an experiment in literary innovation, flawless prose and delicious angst.